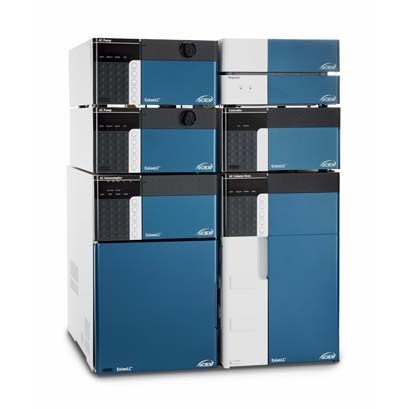 The ExionLC AC system is an all-purpose frontend for LC-MS workflows running a variety of UHPLC separations. A modular workhorse system, the ExionLC AC delivers superior performance and basic UHPLC chromatography so you can push the limits of ultra-high throughput with minimal downtime. Take advantage of the ultra-high throughput capabilities when you combine the ExionLC AC with streamlined methods, industry-proven Analyst® Software, and leading edge LC-MS/MS technology. The ExionLC offers a pressure limit of 660 bar (9500 PSI) which brings within reach most UHPLC methodology using fused core or small particle columns. The modular pumping system delivers gradients up to 3 mL/minute and 5 mL/minute at 440 bar (6,000 PSI). A large capacity solvent tray easily holds up to 2-liter bottles for uninterrupted analyses. The ExionLC AC autosampler holds two microtiter plates or 105 vials in a temperature controlled environment as low as 4°C to preserve thermally-labile samples. A flow through injection system minimizes carryover, typically less than 0.005%. Completing the ExionLC AC system is a high capacity (up to 6 columns) forced-air oven, capable of both heating (up to 85°C) and cooling (as low as 10°C below ambient) to improve separation efficiency, application flexibility and retention time stability. Optional accessories include solvent switching, column switching, sample rack changer and optical detection (variable UV and PDA). With the ExionLC AC, your LC-MS system can tackle whatever your research or customers bring. SCIEX ExionLC AC, the reliable, flexible and expandable solution to get from samples-in to results out fast. Cycle Time < 15 sec. For maximum sample capacity, the ExionLC rack Changer provides up to 12 additional sample trays or vial racks. Each drawer can be configured for either regular or deep-well configurations, as well as 54-vial trays. A general purpose Variable Wavelength Detector, the ExionLC UV detector adds additional flexibility to your ExionLC AC or AD system. Time programmable wavelength switching allows detection sensitivity and selectivity for your specific analytical workflows. The ExionLC PDA (PhotoDiodeArray) detector is an excellent option for identification, quantitation, and purity analyses at trace levels. A high sensitivity flow cell and low detector noise levels ensure uncompromised performance. Need to change between gradient types ? The ExionLC Solvent Selector Valve allows a user to select between two solvents per channel from up to 3 different pumps. Need to change between gradient types? The ExionLC Solvent Selector Valve allows a user to select between two solvents per channel from up to 3 different pumps.